Quinoa has always been one of my favorite grains. I love the subtle crunch that it has when cooked and that it is so high in protein. It’s been slowly rising to stardom recently. It’s a grain-like crop grown for its edible seeds. It’s considered a “pseudocereal,” whatever that means—not a true cereal, not a grain, since it’s not a grass. It’s related to species like beets, spinach and tumbleweeds. It is 6,000 years old and is native to the Andean region of South America. The main reason its star is on the rise here is because of its incredible nutritional value, but I like it because it takes on so many other flavors as a salad. 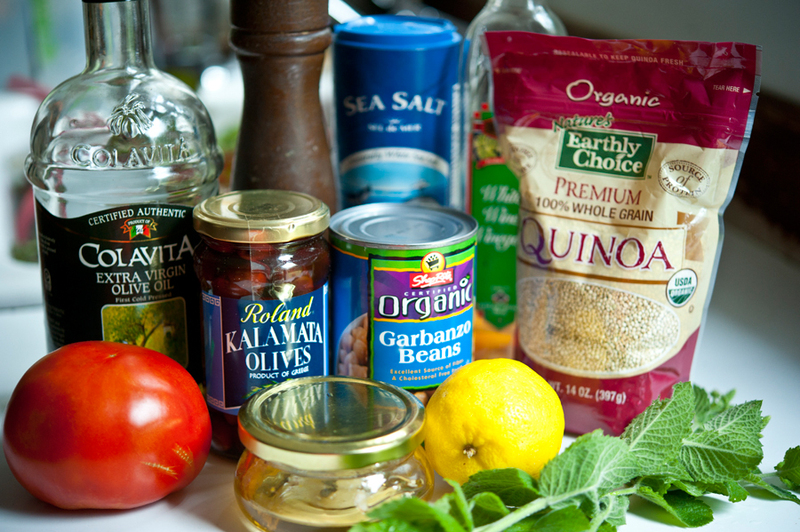 So when I saw this Quinoa Salad with Chickpeas, Kalamata Olives & Mint recipe by the fabulous Dara of Cookin Canuck, I knew I wanted to give it a try. I just love fresh mint in the summer. 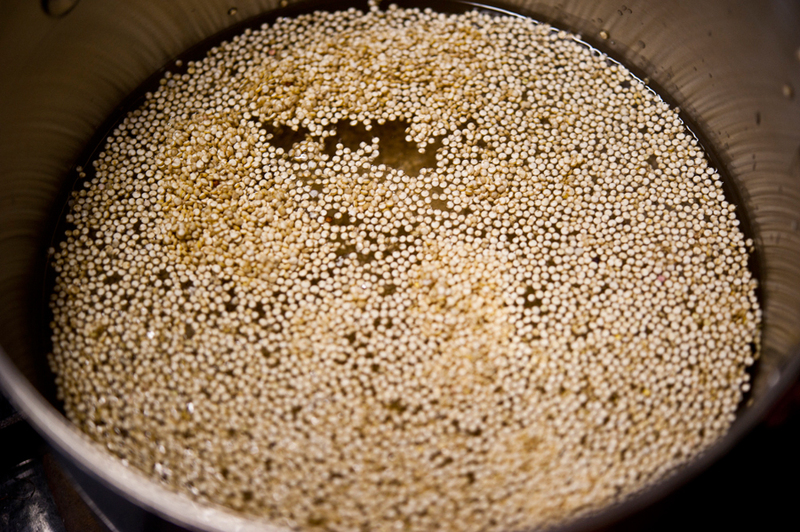 Get the quinoa cooking in water while you prep the rest of the ingredients. Once it is fluffy, let it cool. You can even be very smart about it like Dara was and lay it out on a sheet to help it cool quickly and evenly. 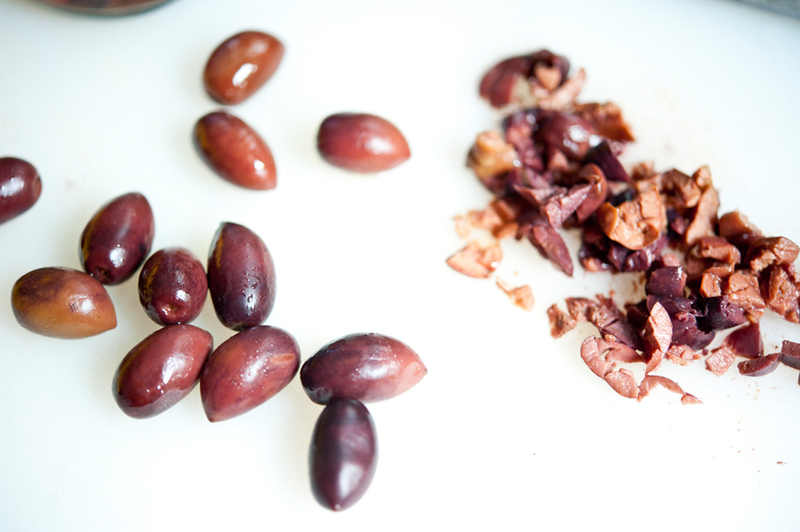 Next chop the Kalamata olives roughly. 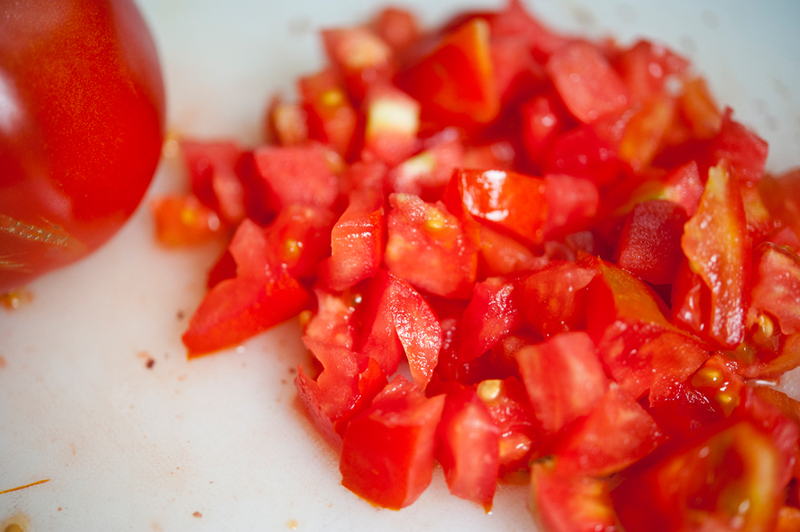 Then make a small dice with the fresh tomato. You could also use cherry tomatoes or grape tomatoes here, whatever is easiest! 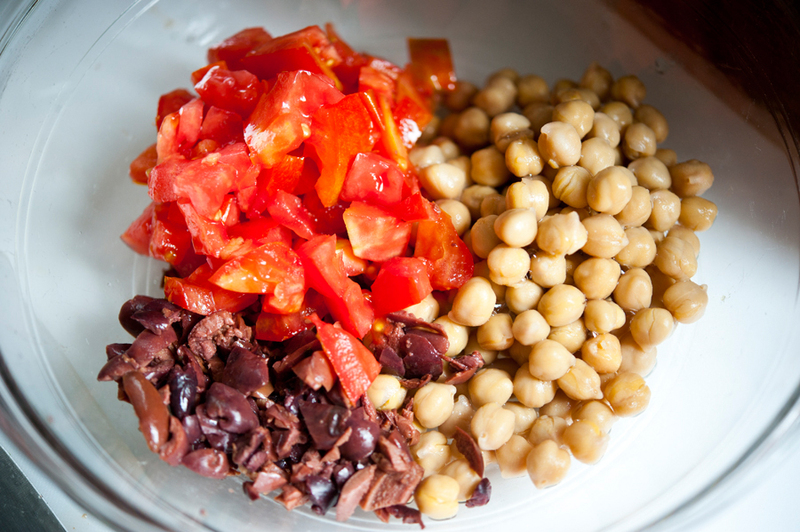 Combine the tomatoes, olives and garbanzos in a bowl and set aside. 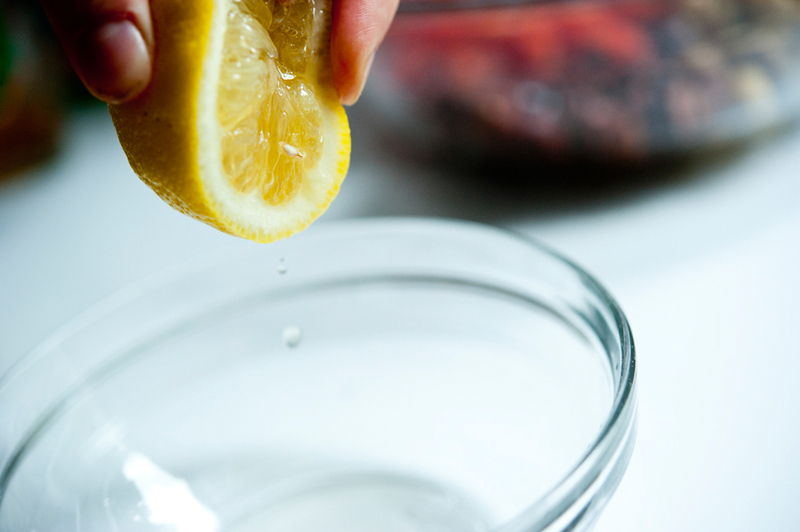 To make the dressing, squeeze some lemon juice into a small bowl. Next add the white wine vinegar. 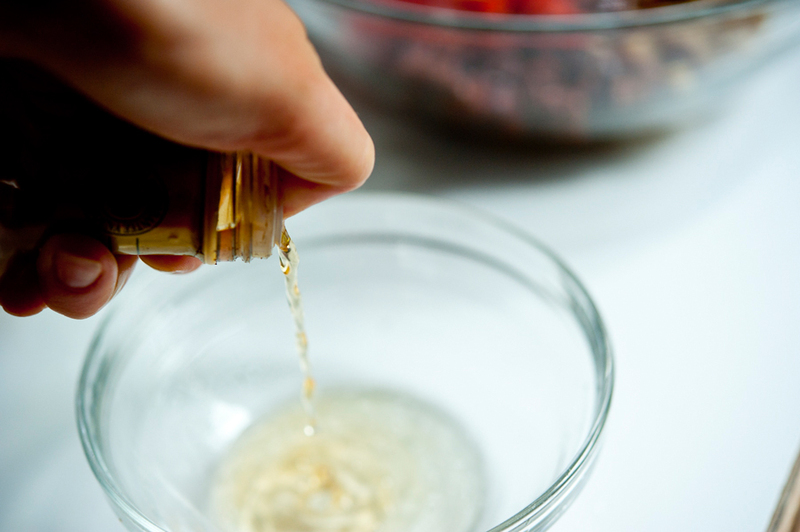 You could also add another vinegar that you have on hand: cider vinegar, red wine vinegar, champagne vinegar or whatever else suits your fancy. Next comes the honey. We just harvested the honey from our bees so this was hot off the presses, or rather hot off the hives. It’s very light and floral tasting, perfect for a salad. Add a little sprinkle of salt! And a drizzle of olive oil. Whisk it all together. 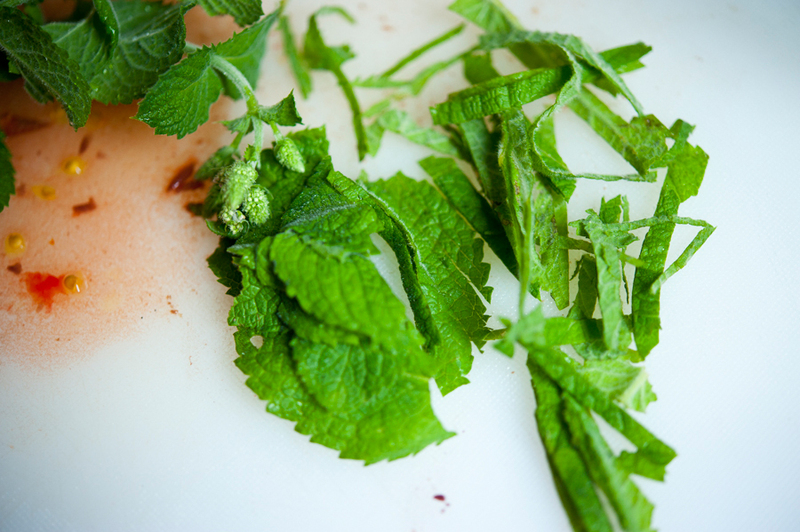 Then comes the fresh mint, which you chop into a chiffonade or even tear up by hand. Add the quinoa and the fresh mint and stir it all together until it’s nicely mixed. Then drizzle in your dressing. The quinoa will soak up some of the dressing and be even more delicious. This makes a wonderful cold salad for a summer party, or also slightly warm. Thanks to Dara for this tasty recipe. Check out her website Cookin Canuck for more! If you loaded the amount of quinoa our family eats in one year into a small boat, that vessel would sink to the bottom of the sea faster than you could say “healthy mini grain” five times fast. This salad is another example of our healthy obsession. 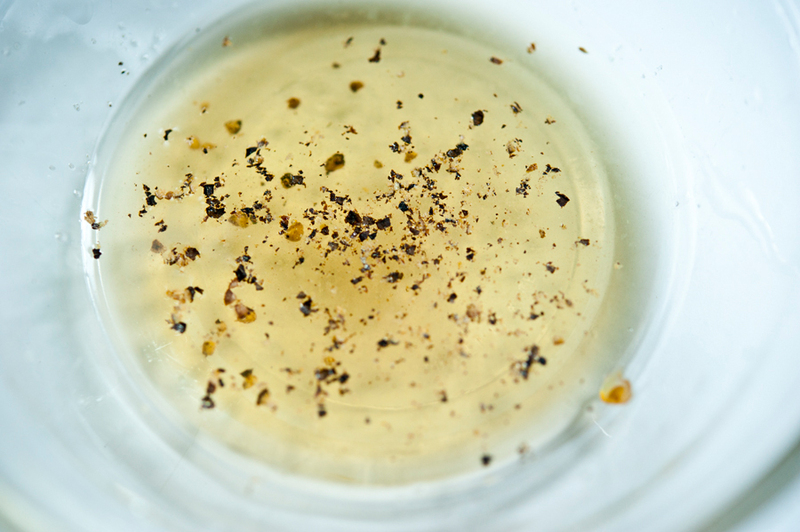 In a fine-mesh strainer, rinse quinoa well and drain. In a medium pot, combine quinoa and water. Bring to a boil, then cover the pot and turn heat to low. Cook until all the water is absorbed, about 20 minutes. 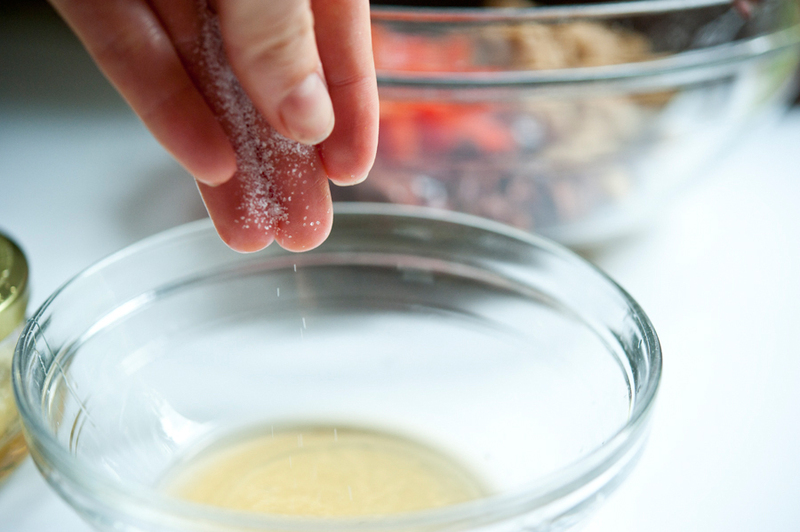 Remove from the heat, fluff the quinoa and transfer to a cookie sheet, spreading the quinoa in a thin layer, to cool. 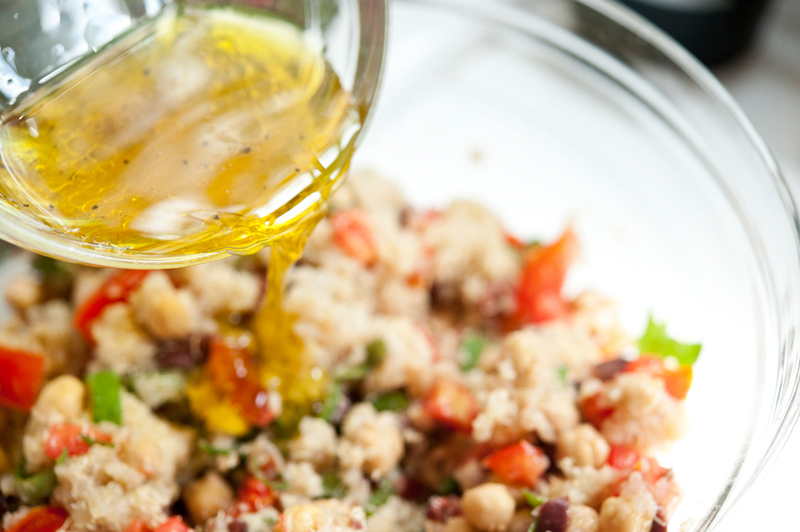 In a large bowl, mix together cooled quinoa, chickpeas, tomatoes and kalamata olives. Stir well. 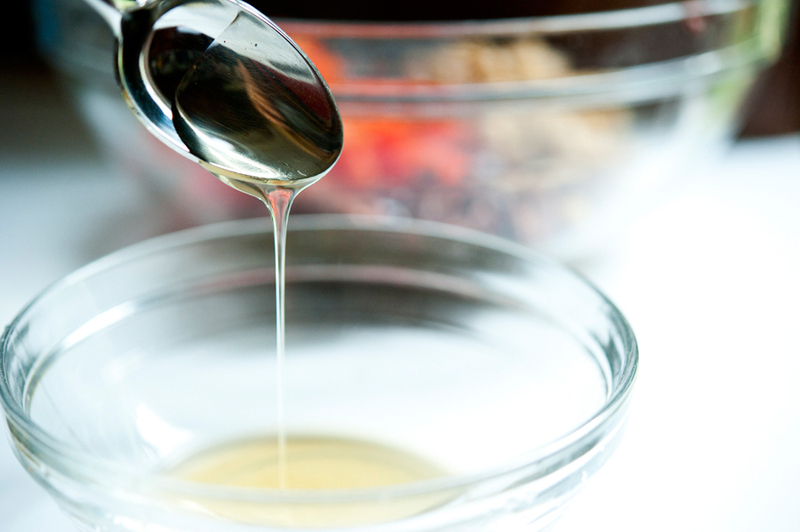 For the dressing, whisk together white wine vinegar, lemon juice, honey, salt, and pepper in a medium bowl. 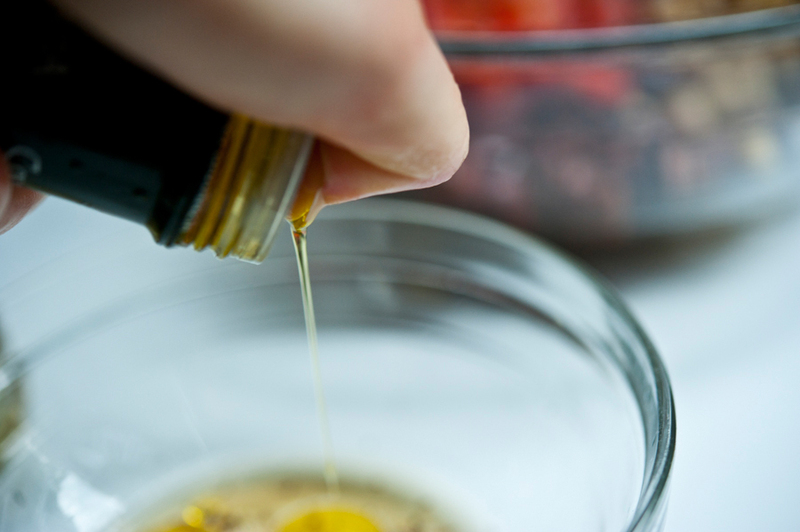 While whisking constantly, slow pour in the olive oil until combined. 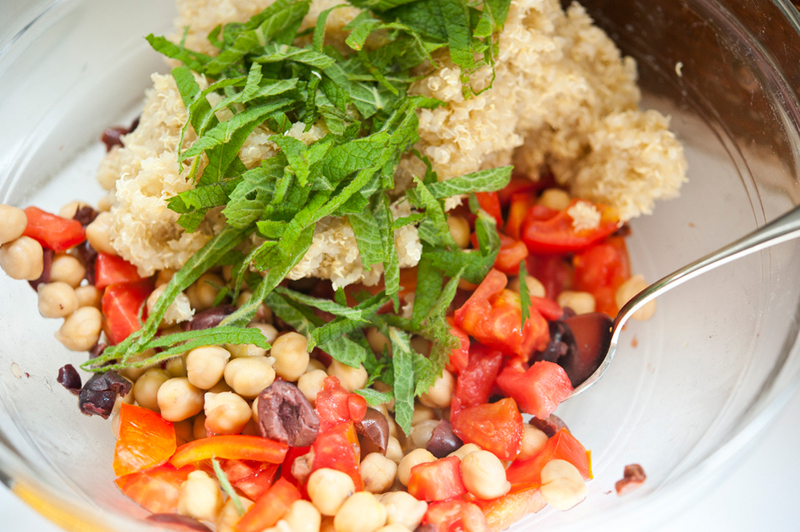 Pour the dressing over the quinoa salad, toss to coat and stir in fresh mint. Serve. There’s so much to say about Georgia, we don’t know where to start. Leaving Wall Street for the French Culinary Institute, followed by a stint at the Gramercy Tavern and La Chassagnette in France, her passion for food and food traditions are evident and inspiring. Visit her site at Georgia Pellegrini, where you’ll find more recipes, photos, learn all about her wonderful book Food Heroes, and enjoy her latest adventures. Wow, that’s an awesome bowl!!! I love quinoa! Thank you for giving me another recipe to try! Zee… I do agree about the bitterness.. I usually rinse mine and then let it soak for about 5 minutes, drain and rinse again. Walah…….no bitterness! This dish and I mean the bowl, is absolutely beautiful! My momma collects this pattern and I hunt for them when I get the lovely chance to go flea marketing! Do you know what the bowl was make for. Like, it is a compote dish, relish, or something else? I know it’s moonstone but I’ve never seen it in my hunts. Yumm! So good. Made it last night for my kiddies and just swapped in apple cider vinegar for them. So delish! Thanks! 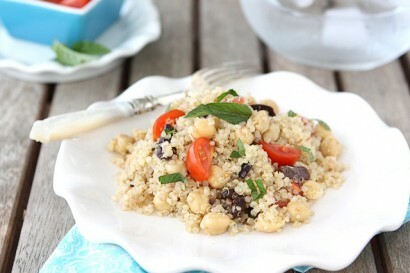 The quinoa salad recipes looks very tasty and I will be trying it. I have been using quinoa more recently and really like it. I used it instead of rice to accompany the red beans I cooked last week. I do find that it is very important to throughly rinse the grain before cooking it. It is easy with a very fine mesh strainer over a bowl filled with water. There really is a bitter taste if you do not rinse it. I really, really wanted to like quinoa…and I do like the flavor. But am I the only one who thinks those little squiggly things make them look like little critters with tails? Sorry, I just can’t get past it. The salad sounds good, but I LOVE the Hobnail Glass dish! mmmm awesome! My vegetarian daughter introduced our family to Quinoa and I haven’t yet tried it cold. I’m definitely going to give this recipe a try, thank you for posting it! Love Quinoa!!! I cook it at least once a week if not more…..and I am currently reading “Food Heroes”…a Fantastic book!!! I need advice here, y’all. I have tried mint in several recipes, and my husband and I, both adventurous eaters, hate it! We looove quinoa and kalamatas, though, so I’m thinking basil would be a good substitute in this salad – what do you think?? And I agree with the other posters – the bowl is to die for!! Where is the best place to buy quinoa? I have been wanting to try it. I saw a small box at walmart for $4.95. That looks great! I’ve been eating quinoa salad all week for lunch. It’s so filling! LOVE quinoa. The first recipe I saw said to rinse it well in cold water before cooking to avoid a bitter (or something like that) taste. I haven’t noticed that on the packaging anymore, but I’m chicken to try without it. It only takes a minute or so, no biggie. My challenge with this (and anything else cooked in boiling water) is that I recently moved from sea level (Orlando, FL) to 9100 feet (Divide, CO). Nothing cooks in the time given on the package. My maid of honor made a similar quinoa salad for my bridal shower. The olives and quinoa play so nice together.. so yummy! It’s probably a bad thing that I read this when I was hungry. As a vegetarian, I can’t get enough Quinoa! Looks delicious! Thanks for the recipe! Love that bowl!!! I can’t hardly focus on the recipe because all I really want to know is how I can get my hands on one like it! Its like you are spying on me! I made a quinoa salad over the weekend for lunches this week. Didn’t add the garbanzo beans to it but certainly will next time. I’m moving soon and didn’t want to buy a whole jar of olives so I paid a visit to the olive bar at my grocery store and was able to add in lots of other yummy stuff- peppadews, marinated mushrooms, feta, etc. It can be different every time. I love how quick quinoa can cook! Love the use of mint. wow! a great transition dish for fall! I made a pesto-brie bowl which was the simplest appetizer ever! Check it out! I am always looking for more ways to enjoy quinoi!! I’m so glad you enjoyed the salad, Georgia. This is one I make again and again for my family. Thanks so much for featuring it here! 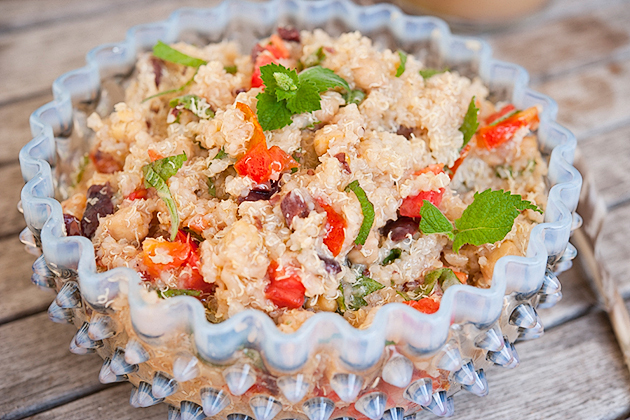 I love a good alternate recipe for quinoa salad! Can’t wait to give it a go! i loved this when i saw it on cookin’ canuck and i love it again now…so easy and so delicious! Oh, thank you for this! I have been looking for quinoa recipes but had a couple great “misses” lately. I can’t wait to give this a try!